Yes, an underpass would be more ideal, I was considering that. My only concern is being able to fit it in and have decent sight lines in this cramped area. I think good sight lines into the underpass is important for safety. I'm not saying it isn't possible, I'm just not sure how to best fit it in here. I think 3rd St should also be turned into a pedestrian underpass, both for passengers changing platforms (the new station will have ramps to both 3rd St and to Everett Ave) and for pedestrians. That area is primed for development, as developers love all those low-utilization super-blocks, plus people might be walking down to Market Basket from the residential area of Everett and walking down along Vine St to 3rd St.
leviramsey wrote: You need to have a transitmatters email address in order to sign into the slack channel and see the file. Probably not enough room to do a linear underpass like Yerxa Rd. the way the streets are going to boomerang tight around the closed 6th/Arlington crossing, so only way to cram it in there is to do either one switchback ramp on each side a la Sacramento St....or (perhaps better) a right-angle underpass where the ramps descend fully adjacent to the ROW on each side, then cross under narrow-profile in a "Z" pattern. The ped crossing in the schematic is nice and clean, I just think the ROW width is still a bit daunting and doesn't leave much space for an eastbound bus coming out from under Route 1 to see anybody standing on the south side of the crossing. At *most* it would only be a good idea to do that as a temporary thing until the city agrees on an independent design for an underpass with I.O.U. to go finish the job. New Chelsea platform wouldn't get anywhere near close enough to 3rd to put egresses way back there. The 800 ft. platform ends by the blocked-off end of Carter St. and the Market Basket back lot. Peds can easily be dispersed to via Carter, and 2nd St. via a sidewalk behind MB with far greater ease than trying to do anything with 3rd. So that crossing is still utterly superfluous for all traffic, wheeled or bipedal. The only danger is that if they do nothing whatsoever forever with the west ends of the platforms there will be a risk with increasing utilization of people trying to shortcut their way over the west-end barriers to walk along the tracks to get to 2nd. There needs to be some sort of master plan to accommodate dispersing foot traffic as the area gets redeveloped...though much moreso on the MB side closer to retail and the new residential by Commandants Way (the blocks around Carter & Vale are still pretty scary and bombed-out). Who knows...maybe if they can eliminate these two grade crossings cheaply there'll finally be some forward momentum to re-study Eastern Ave. elimination that's been languishing since the '04 Study recs ($19M in '04 $$$). That would whack the speed restriction all points east of the new station cutting travel time to Lynn/Salem and finally get rid of one of the most dangerous crossings in the whole state. F-line to Dudley via Park wrote: New Chelsea platform wouldn't get anywhere near close enough to 3rd to put egresses way back there. The 800 ft. platform ends by the blocked-off end of Carter St. and the Market Basket back lot. That's what I would have thought, but they are centering it to some degree due to the placement of the ramps on the Everett Ave end. 170' ramps bump the platform that far from Everett Ave, resulting in just 300' of ramps for egress to 3rd St, as shown. I noticed the scheduled meet at Newbury the other day - the inbound train departs 1 minute before the outbound is due. Presumably leaves room for the 5 min. late arrivals I've come to expect picking visitors up. AFAICT, this is the first scheduled use of the Newburyport double track since the line opened. It supports 0915 and 1000 inbound departures, a considerable change from the pattern of 0930-ish and 1100-ish that prevailed while I was commuting. With the old pattern, those consists met between Beverly and North Beverly. There used to be only two Ipswich meets, morning and afternoon. In the long run, the T needs a better grasp of express/local service. From the transit planning PoV, Chelsea has been an excellent candidate for a stop to skip since its inception, but politics. Every grade crossing that's eliminated moves us closer to potential reinstatement of the Boston - Lynn timings the B&M achieved in the 1960s. Eastern Ave. is the worst offender, because it doubled its length of the go-slow zone. From what I've read/been told, Eastern Ave originally had the reduced speed (30 MPH while head-end is going over the crossing) put in place because of the traffic signal right next to it at Eastern & Crescent. The fear was that traffic -- particularly gasoline tankers -- would get caught on the crossing during a red light phase. This was addressed by synching the lights with the crossing signals, but the restriction remained. It might now have something to do with the new-ish elementary school built next door, which I'm not sure there was one there before. And so, we're here, with a crumby dot of 30 MPH in between a stretch of 65 and 70. By the way, on those Eastern Ave Grade Separation plans, IIRC, the plan was for the road to go over the tracks, correct? Is going under not feasible due to the proximity of the Chelsea Creek? It appears that was a result of the fatal 2nd Street crash in 1966, where a Buddliner hit a gasoline tanker, killing 12. 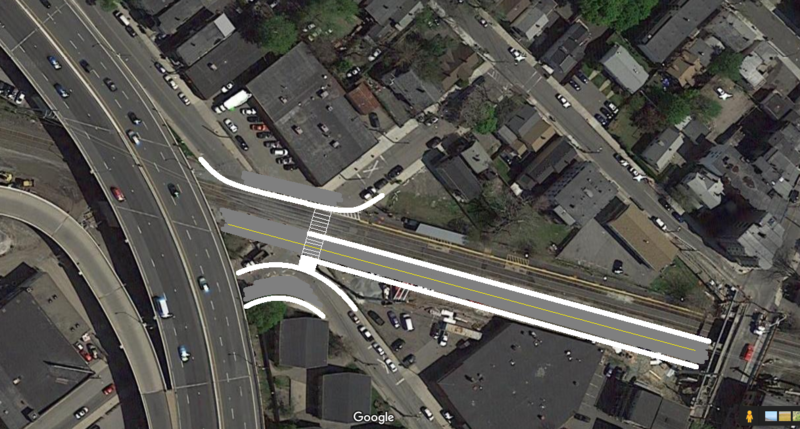 BostonUrbEx wrote: By the way, on those Eastern Ave Grade Separation plans, IIRC, the plan was for the road to go over the tracks, correct? Is going under not feasible due to the proximity of the Chelsea Creek? Not sure, since the '04 Study only published that one preferred rec for a road bridge and didn't do any document dump of all the rejected alternatives. Because the study was so broad in scope they didn't have bandwidth for pubbing an extra thousand pages from the cutting room floor informing how they culled the universe of possibilities into a final series of pan- North Shore transit recs. Wouldn't be difficult at all to do as rail-over-road. There's a 2000 ft. straightaway north between Eastern Ave. and the Forbes St. overpass...more than enough to build the embankment up on gentle 1% or less grade and bridge over Eastern at 16 ft. default overhead clearance for a truck-carrying arterial. It's 950 ft. tangent to the south of Eastern before start of the curve, but (1) it's a slight curve and (2) moving the last couple power line towers before they turn out into the Box District substation can widen out that straightaway to up to 1200 ft. before the slightest of curve begins near bottom of the incline. Meaning you should easily be able to keep an equally gentle 1% or less grade on that side too. There's derelict sidings on both sides of the crossing and no need to provision for any future side-by-side Silver Line spur on this side of the ancient Grand Junction/Eastern RR wye, so building up the sides of the embankment within existing property lines shouldn't be an issue either. If I had to guess, cost of the road bridge probably ended up cheaper than building up a rail embankment because of the much more compact project area. It isn't that the EIS'ing would've been in any way hard for a rail embankment + overpass since the surrounding land is all brownfields and/or very polluted riverbank. But it's more linear feet & acres worth of land permits, more quantity & types of permits encompassing more heterogeneous land use (small stretch of river shore, brownfield private property backlots, the electric utility, and more-varied private abutters). So tally up all the extra paper-pushing for the larger project area and I would not be the least bit surprised if the price tag ended up a few $M inferior to a road overpass any way you design it. All despite the somewhat better conceptual 'cleanliness' of a rail bridge that doesn't need to alter any abutting driveway access like the road overpass would. All relative, as that whole stretch of Eastern south of Webster Ave is a permanently industrial eyesore that needs no special accommodation. Either method probably priced out pretty cheap in absolute costs. $19M in '04 $$$ was a downright bargain for a perma-fix for that onerous speed restriction and scary safety risk with the bad-angle crossing of a speed-trap arterial full of 24/7 leadfooted gas tanker drivers. With MassDOT more experienced today at prefabbing bridges quickly...and river barges 1200 ft. down the street @ Global Petroleum being able to float giant pieces to the site...they could probably hold the line close to that cost 15 years later simply through all the gained construction efficiencies canceling out most of the accrued inflation. The only reason this proposal--like nearly all eminently sensible and high-ROI recs from that study--were never implemented was because of total Beacon Hill indifference. They built the white elephant garages years late and hugely over-budget, and tried to pass that off as GLX delay mitigation (!!!) of all things. Were it not for that passing the laugh test by the slimmest margins, it wasn't even guaranteed that parking-mad Massachusetts would've been self-motivated enough to even finish the job on the two garages given how long those also dragged out. The whole North Shore is a longstanding transit anti-priority in the Legislature. Something as function-over-form as a crossing elimination never would've stood a chance given how little follow-up was given to all the much higher-profile service increase and steel/concrete station edifice stuff in those long-suppressed study recs. Is there every any chance of them increases the frequency of weekend trains? The train schedules are making my trip to Boston today really not feasible by commuter rail. Going to a concert where doors open at 6. Show starts at 6:30. My train options get me to North Station at 3:56 or 6:21. Normally I would walk around Boston in a case like this and waste some time. But the weather today is not optimal of that. If I take the later train, there is a good chance I'll miss the first band. I'm guessing in a case like this driving to Wonderland is the best option? Just out of curiosity, which line has the highest ridership. Newburyport or Rockport. My guess is going to be Rockport as I see more longer sets and this is where the extra trains usually get added. Your guess would be wrong. Rockport gets higher ridership on weekends, but during the week Newburyport is the clear winner (which is why it's always surprised me that Rockport gets seemingly better service). Railfan & Roadgeek from the North Shore of Mass. I am trying to aim more for the Rockport trains now for this reason. For example, the Rockport express at 7:53am at salem usually has 6 Cars, sometimes 7. Today It had the Passenger Count train with 5xDouble Deckers. The Newberyport express at 8:23am has been running 4 car sets lately more often then 5. It's always over crowed and a lot of times standing room only. Noticing the same on the night trips home as well. Checking The EGE, ETT #21 updated through 4/21/77 shows 35 MPH East Everett to Chelsea and 30 MPH over Eastern Ave. But before the almost-all-trains stop at Chelsea, the Eastern Ave. restriction didn't affect schedules as much, particularly since I seem to recall many engineers bending it, if not breaking it outright. The Eastern Ave restriction is for head-end only, and would explain any alleged "bending" off the rules. Why is the inbound track through Lynn station so bumpy? When ever you take an express train and cruise through Lynn on the inbound side it's a bumpy ride. This morning, the express train hit that stretch of track faster than usual and the bumps were really enough to bounce you around in the train. One of the conductors said "That was scary" when it happened. Not sure if bumps like these pose any kind of derail hazard but they certainly should be addressed Some one walking through the train or standing could definitely fall. Is there a restriction on the drawbridge by River works where 2 trains can't pass each other at the same time on the bridge? It appeared that way this morning. We met a train at the draw bridge and both of us had to stop. Then one train slowly crossed while the other waited.